An ankle-foot orthosis (AFO) is an orthosis or ankle foot brace (usually plastic) that supports the ankle and foot. AFOs are externally applied and intended to control position and motion of the ankle, compensate for weakness, or correct deformities. Arch City Foot and Ankle and Dr. Dennis Timko are using new techniques for providing his patients with AFOs. Why send your patients to another location, instead make one trip to Dr. Timko’s office for full evaluation and customizied fitting for your AFO. 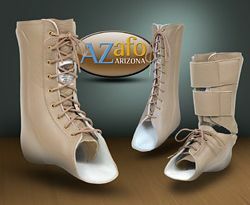 See Arizona AFO for all the different type of AFOs that we can provide. We can also provide prefabricated ankle foot brace for you. About 50% of patients do very well with a lower end prefabricated ankle foot brace rather than a custom brace. You must get evaluated first to see if you are a candidate for either a custom or non-custom ankle foot brace.